ARLI Glyco-Infusion is a carbohydrate powder that stands out significantly from other supplements of that type. Its base is a specially enzymatically modified rice syrup in a solid form. The initial digestion of nutrients makes it possible to absorb carbohydrates immediately, which helps to build the glycogen base that the organism is going to take energy from during the entire workout session and regeneration phase. Thanks to the combination of two features so desired in such supplements, that is high assimilability and long release time in the organism, the product is extremely useful at every stage of training. Used before workout, the product helps to fill muscles with glycogen, providing constant access to energy throughout the entire training session, at the same time maintaining maximum efficacy of exercises and making it possible to use the full potential of your muscles during workout. The supplement should also be a good choice for people building the base for long-lasting aerobic exercise by carbohydrate loading (which leads to glycogen supercompensation). Thanks to the initial enzymatic treatment of the carbohydrates contained in the powder, the product is also fantastic for drinking during training. It will help you to maintain full exercise capacity even during the longest effort without straining the digestive system thanks to the fact that muscles are filled with glycogen. That is the feature that definitely makes the supplement stand out from its competition. During intensive training, the human organism is directed by the sympathetic nervous system, which limits blood flow in digestive organs to the minimum, inhibiting the functioning of the system. By taking initially digested carbohydrates, you don’t have to worry that they won’t be fully assimilated or that you will experience some problems connected with the digestive system, which might be unable to deal with the provided nutrients. The supplement is also a great choice after workout, when muscles run out of glycogen as a result of intensive effort. A post-workout dose of carbohydrates will prevent catabolic processes in exhausted muscles, accelerate regeneration, and create an anabolic environment by increasing the secretion of insulin-like growth factor (IGF-1). The enzymatic treatment of the supplement provides the immediate assimilation of nutrients and minimum strain on the digestive system. The manufacturer guarantees the highest purity of the product, providing only 3 grams of fat per portion (apart from carbohydrates). That, however, should not be seen as undesirable, as the fat comes entirely from MCT oil, characterised by medium-chain saturated fatty acids, which are also a fantastic source of easily accessible energy. The product is gluten-free and can be consumed by vegans. 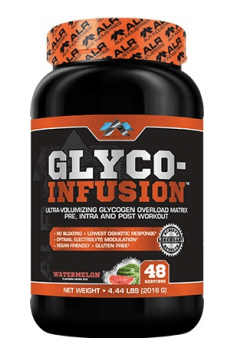 ALRI Glyco-Infusion is an incredibly versatile supplement that is applicable in the supplementation plan of every intensively training sportsperson, regardless of what type of activity they like. The unique method of treating the carbohydrates contained in the supplement and the highest quality of material guaranteed by ALRI Industries makes the product a diamond on the supplement market, worth every sportsperson’s attention. Rice syrup solids, MCT Oil, Silica Dioxide, Amylase, Hemi Amylase, Cellulose, Bromelain.